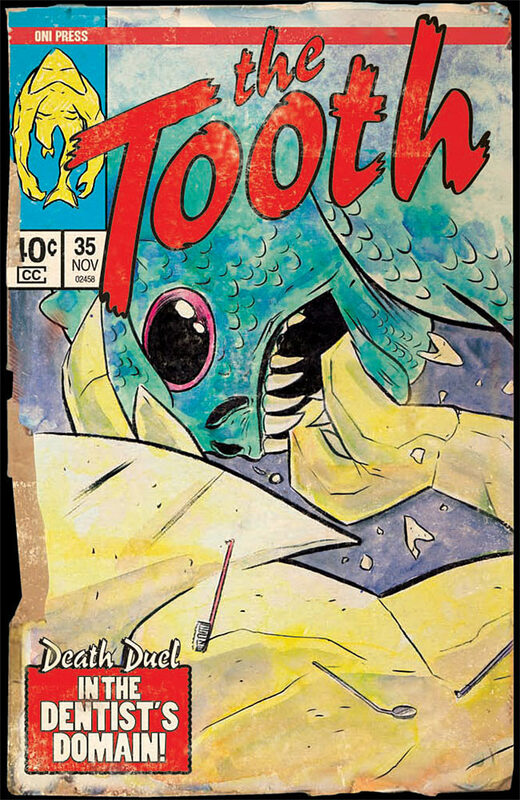 Here’s just one of the fun covers by Matt Kindt interspersed throughout “The Tooth”! 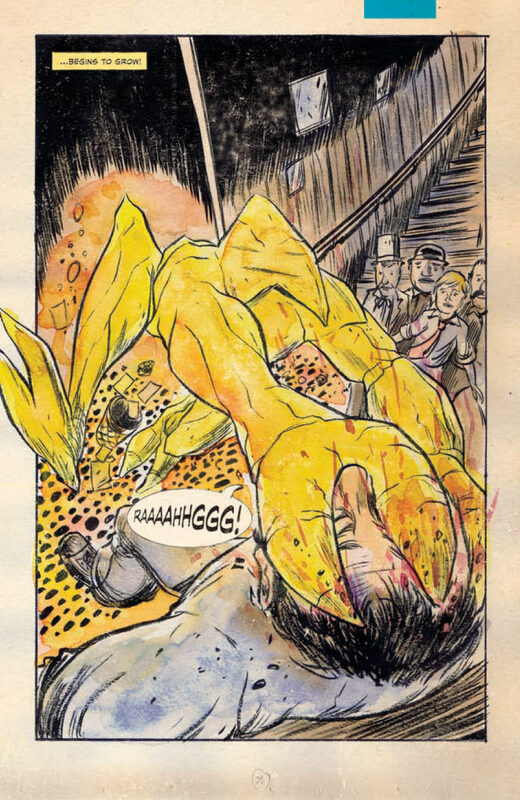 The most unlikely of heroes is featured in “The Tooth”, amusingly written by Cullen Bunn and Shawn Lee and superbly illustrated by Matt Kindt. The story of the ancient and mythological creature known as “the Tooth” (who is, in fact, a tooth) is a joyful love letter to comic books and the superheroic characters that have resided within their pages for decades, with just part of the book’s fun being in its interactivity. Reading “The Tooth” is like flipping through back issues of one’s favorite character. The pages look aged and dog-eared, with certain panels looking faded with age. Advertisements for toy soldiers (of the Confederate, Union, AND alien kind!) and other assorted goodies occasionally pop up to bring a smile to one’s face. There is even a letter column named “The Tooth Hurts” interspersed throughout the book, with rantings by “readers” of the book complaining about continuity, art, and the way certain characters act “out of character”. Any comic book reader will recognize the joy of comics in this playful book by Bunn, Lee, and Kindt and, hopefully, this book will create new readers and instill within them the same love of the comic book art form that long-time readers have felt for years. The story begins like a mysterious vignette straight from “The Twilight Zone”. Intrigue is introduced when Graham Stone arrives in Grover’s Point, South Carolina with his fiancee, Beatrice. Graham has inherited the estate of his grandfather Ezekiel. Not only does he inherit an estate, but he inherits a tooth with great powers and a mythological history. Bunn and Lee, along with Kindt, convey the history of the tooth with dollops of imagination, excitement, creative violence, and a hero who stands tall and proud. The splash page that ends the telling of the Tooth’s origin demonstrates the synergy Kindt has with the writers. The colors are more faded during this flashback, with the sky an orange-red and a triumphant Tooth standing among a pile of bloodied and defeated hordes. Color, art, and design fluctuate when the story does the same, adding depth and imagination to a simply fun story. Humor is an obvious aspect of a book featuring a character named the Tooth. Bunn and Lee use language in clever ways and, like comic books of old, even utilize a narrator that speaks directly to the reader. At one point in the story, an army of ghosts attack the protagonists. The unseen narrator inquires of the reader, “How does one defeat an army of ghosts? 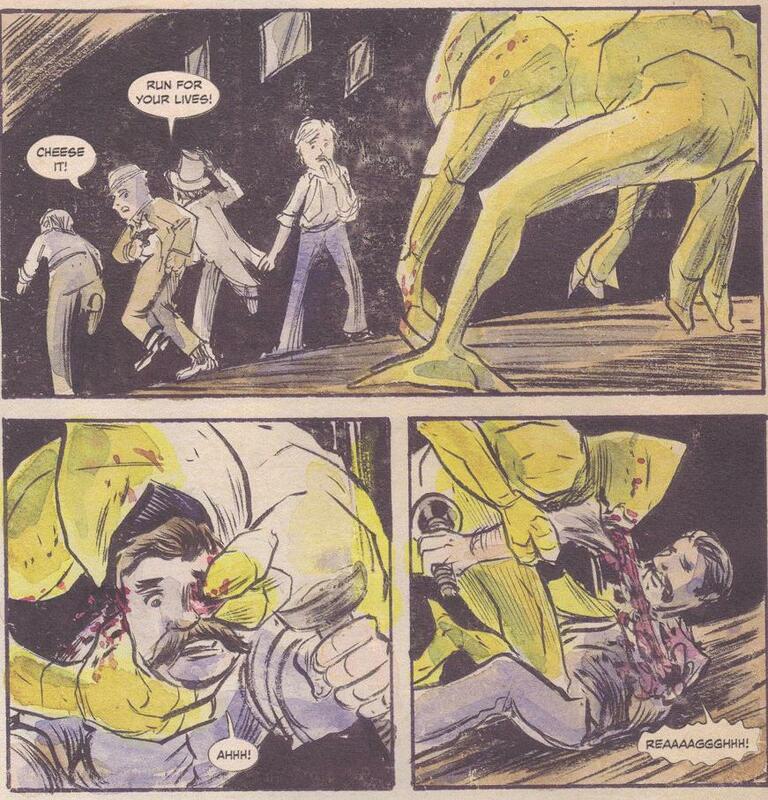 Let’s hope our heroes can figure it out.” He or she even ribs the Tooth by declaring that “the only thing more fierce – more dangerous – than a mythological creature…is a mythological creature with daddy issues!” In the background of this particular scene, Kindt depicts the Tooth violently (and delightfully) attacking a creature with utmost abandon. Humor and imagination aren’t just relegated to the writing. As the Tooth’s stats describe him at the beginning of the graphic novel, he is “only 60% as strong as Superman but just as tough.” That is definitely an appropriate description for this hero. When the Tooth is first awakened, he glows a magnificent yellow hue. He begins to grow, and, in a shocking splash page, he leaps full-size and mercilessly clutches a goon with a claw. Bystanders stand in shock and awe as he begins to rip the goon to bloody shreds. As if looking toward the reader, the Tooth ceases his assault of carnage and glances outside the panel with what looks vaguely like a smirk on his bloodied face. Naturally, the bloodied face of his victim lies underneath him. Although he never has intelligent conversation with anyone during the story’s proceedings, Kindt imbues the Tooth with personality, raw emotion, and humor. As adept as Kindt is with splash pages and action scenes, he is equally talented in character design and expression. When the villainous Caleb King first introduces himself to Graham, Caleb’s dastardly demeanor, debonair outfit, and gray coloring set him up to clearly be the villain. When he smiles and flashes a missing tooth, the reader will be intrigued as to why he wants his “wayward child” back from Graham’s deceased grandfather’s belongings. Nuance is expressed in facial expressions many times throughout the book. In one particular exchange between Graham and Beatrice, three distinct panels express many distinct emotions. After Graham says Beatrice can’t contact him while he’s alone at the house because of its lack of reception, he says, “but I’m sure you’ll hear my bloodcurdling scream.” The reader can clearly see the exaggerated fear and playful fun he’s having at his fiancee’s expense. Beatrice glares at him angrily, yet with concern in the following panel. In the third panel, Graham holds his hands up and says, “Just kidding! I’ll be fine.” His eyes squint, his mouth opens in a nervous smile, and his brow furrows. This scene is just one of many “smaller” scenes where he can convey such important storytelling elements as foreshadowing and suspense in such a larger-than-life tale.